I recently stumbled upon an interesting piece of information when I was working on deep neural networks. I started thinking about initialization of network weights and the theory behind it. Does the image to the left make sense now? 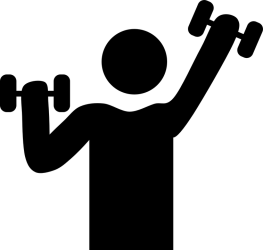 The guy in that picture is lifting “weights” and we are talking about network “weights”. Anyway, when we implement convolutional neural networks, we tend to utilize all the knowledge and research available out there. A good number of things in deep learning are based on heuristics! It’s worth exploring why we do things in a certain way whenever it’s possible. This goes a long way in unlocking the hidden mysteries of deep learning and why it’s so unbelievably accurate. Let’s go ahead and understand how network weights are initialized, shall we? Why do we need initialization in the first place? When you are working with deep neural networks, initializing the network with the right weights can be the difference between the network converging in a reasonable amount of time and the network loss function not going anywhere even after hundreds of thousands of iterations. If we use this as the activation function, then we know that it is approximately linear when we go close to zero. This basically means that there won’t be any non-linearity. If that’s the case, then we lose the advantages of having multiple layers. If the weights are too large, then the variance of input data tends to rapidly increase with each passing layer. Eventually it becomes so large that it becomes useless. Why would it become useless? Because the sigmoid function tends to become flat for larger values, as we can see the graph above. This means that our activations will become saturated and the gradients will start approaching zero. Initializing the network with the right weights is very important if you want your neural network to function properly. We need to make sure that the weights are in a reasonable range before we start training the network. This is where Xavier initialization comes into picture. What exactly is Xavier initialization? With each passing layer, we want the variance to remain the same. This helps us keep the signal from exploding to a high value or vanishing to zero. In other words, we need to initialize the weights in such a way that the variance remains the same for x and y. This initialization process is known as Xavier initialization. You can read the original paper here. How to perform Xavier initialization? The reason they do this is to preserve the back propagated signal as well. But it is more computationally complex to implement. Hence we only take the number of input neurons during practical implementation.